Like any good New York opera fan, I heeded the calls of prominent persons and went to go see Angela Meade and Jamie Barton headline the second cast of Norma last week. (Sorry that I’m slow to write, but some people indicated they were still interested so I figured better late than never.) I arrived with high expectations, but I only saw one breakthrough, not two. Angela Meade sounds like she finds Norma a more natural fit than Sondra Radvanovsky did. Perhaps her singing sounds easier, period. She’s got a sweet, silky tone that slides easily through the coloratura and still has the force to fill the house. 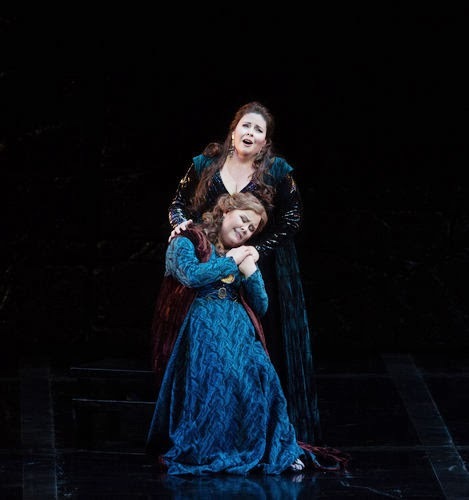 She struggled with breath in “Casta diva,” cutting several phrases short, but improved over the course of the evening and showed real force in the final scene. She’s fairly musical and varied her vocal color more than I have heard from her before, but has a bit of a tic when it comes to high notes, singing many of them pp, a few ff, and few anywhere in between. But if her singing appears effortless, her acting is anything but. She is trying, but it’s a matter of indicating rather than embodying, and was rarely convincing. Most problematic were the several times where she brandished her dagger at someone–her children, etc.–where I never believed in the least she could stab anyone. I was up in the very last row of the Family Circle (more on that in a little bit), which is a bad place to see acting at all, but I could still detect a severe charisma and conviction deficit. So while this was a vocally successful Norma, and that’s nothing to sneeze at, it was not a particularly moving one. As Pollione, Aleksandrs Antonenko was a holdover from the first cast. He was rather better this time around–still blunt, but less clumsy. You can read my thoughts on the crappiness of the production here. It had been months since I had been up in the back of the Family Circle. Student tickets have been available for almost everything recently and they are (counting fees) less expensive, plus you get to see and don’t have to plan far in advance. But those seats are often in the back corners of the orchestra, where the sound is drab. I kind of forgot how glorious the acoustic is up high: you trade visual presence for aural presence. The further away it looks, the closer it sounds. It makes me wonder to what extent the size of the Met has been a determining factor in the house’s production aesthetic, beyond the difficulties of filling the large stage. Some of the most noisy and devoted patrons—though probably not the richest ones—are sitting where the architecture renders the visual aspects secondary. (Unless you go for the scenic equivalent of carpet bombing, and, well, who is the house’s signature director?) There is a certain school of thought that defines creative production and acting primarily as compensation for less than distinguished singing. While I am sure they found this Norma overall more satisfying than I did, I think that’s a limiting view and really a shame. I will be missing the first FroSch later this week because I will be in Pittsburgh at the American Musicological Society’s annual meeting (do say hi if you’re there, readers). I’ll catch up with the Empress, Barak, and the gang next week. Bellini, Norma. Metropolitan Opera, 10/28/2013. Angela Meade is a work in progress. I heard her sing Donna Anna this summer and she didn't measure up to the pre-performance hype. Perhaps it was an off night for her, but the phrasing and dynamic palette were underwhelming. And dramatically, she wasn't much better. I know she'll keep working on the voice; I hope she engages a good dramatic coach, too. Ms. Barton is the real deal and I look forward to hearing more from her.